A car accident report can be a useful tool in whatever steps you may wish to pursue following an accident. If your car accident was responded to by a Baytown Police Officer, the responding officer likely filled out a Baytown Car Accident Report. If your accident was responded to by a Texas Peace Officer, then a copy of your Texas Police Officer’s Crash Report can be ordered through the Texas Department of Transportation (TxDOT). Information about doing so can be found on their website. It should be noted that the following information is only relevant to accidents that were responded to by a Baytown Police Officer. If your accident was not severe enough to warrant the filing of a car accident report, and was not investigated by a police officer, you can choose to fill out a Blue Form for your own records. Information about doing so can be found here. If you would like to order a copy of your Baytown Police Accident Report, you have two options for doing so. We’ll get your Baytown accident report for you. Just provide the details of your accident, and we’ll track down your Baytown accident report and email it to you. 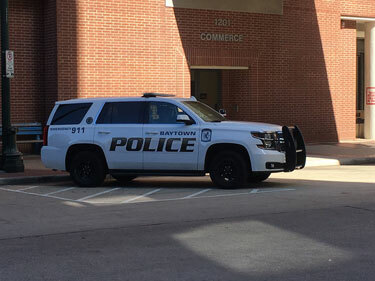 A copy of you Baytown Police Accident Report can be ordered through the Baytown Police Department by filling out the Baytown Police Department Crash Report Request form, a copy of which can be found here. The form should be completed with the date and time (if known) of the accident, the name of any involved person, and the incident number (if known). The form also requires the name of the person requesting the report, as well as his or her role in the incident (i.e. driver, passenger, owner of damaged vehicle). It is important to provide as much information as you can, as it will aid in the location of your Baytown Accident Report. The final section of the form requires your contact information and a certification that the information you provided on the document is true. The completed form can be taken to the Baytown Police Department lobby, located at 3200 North Main. The Police Officer’s Crash Report costs $6, while a certified copy of the Police Officer’s Crash Report costs $8. Check and money order are both acceptable forms of payment and can be made out to the Baytown Police Department.